Osteospermums are also known as African Daisy, Spanish Margarite Daisy, or Cape Daisy. They are full of blossoms from spring to early fall and can take a light frost. Plant in a sunny location in well drained soil. These annuals make great Thriller plants in containers or baskets, or mass plant them in an annual planting bed for non stop color during the summer. Deadhead Osteospermum to encourage more blossoms during the season. 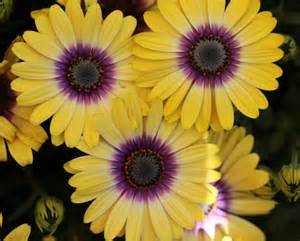 Blue Eyed Beauty Osteospermum has lemony yellow blossoms with a purple eye. It will grow from 12" to 14" tall and just as wide. 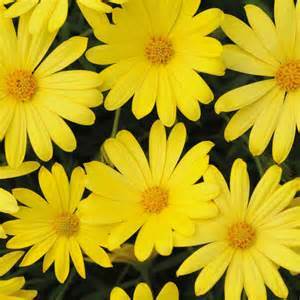 Voltage Yellow Osteospermum is a bright yellow daisy that will reach from 10" to 16" and 24" to 28" wide. Orange Symphony Osteospermum has orange petals with a brown center button. It will grow from 8" to 14" tall and 12" to 14" wide. Serenity Bronze Osteospermum has bronzy orange petals with a hint of purple and a purple center. It will grow from 10" to 14" tall and 14" to 20" wide. Serenity White Osteospermum has pure white petals and a purplish center. It will grow from 10" to 14" tall and 14" to 20" wide.